Croom Concrete’s strong and durable precast concrete headwalls are the ideal outfall connections into open water areas such as collection ponds, swales and rivers. They minimise erosion at the outfall connection points, thus preserving the surrounding environment, and, with no on-site shuttering or formwork required, installation is quick and comparatively simple. This is a distinct advantages where drainage is being installed in difficult to reach areas, or where the impact on the environment is a crucial factor. Any drainage system requiring a clean and durable outfall, particularly where on-site manufacture would be difficult. Croom’s pre-cast concrete headwalls are manufactured in accordance with Eurocodes 2 and 7, EN 15258 and EN 13369. They come in four sizes; small, medium, large and extra large (the extra large size is manufactured as a two piece unit). 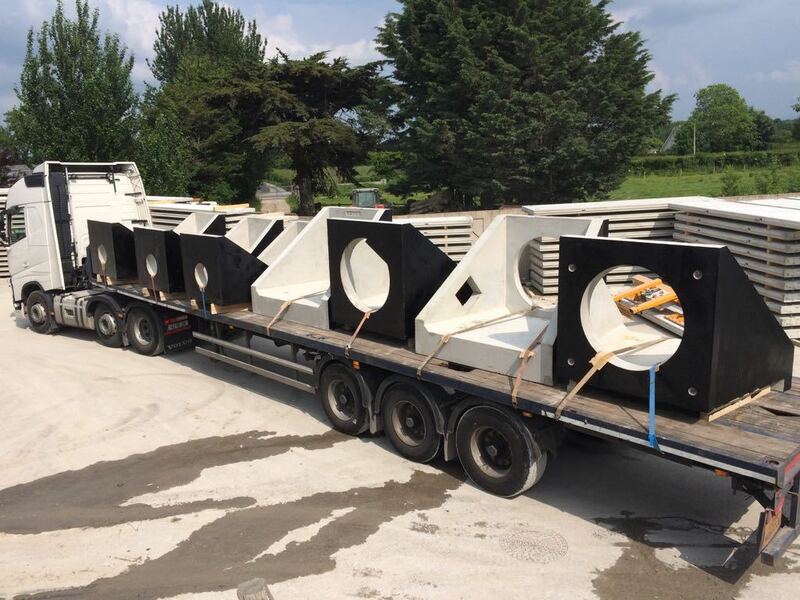 They can be pre-fitted with a range of flap valves, and other accessories such as penstocks, safety grates (flat, hinged or cranked) and handrails can also be supplied for fitting on site. Lifting loops attached to cast-in lifting sockets allow the headwalls to be manoeuvred into place using standard chains. The headwalls can accommodate clay, concrete or plastic pipelines. The holes in the headwalls are sized to meet the individual requirements of the customer, who should allow a minimum of 20 mm between the outer pipe diameter and the hole size. Once the pipe has been inserted into the headwall, it should be sealed using a hydrophilic sealant to ensure a watertight join. The pipe should then be fixed to the headwall opening using mortar, or a similar suitable medium.